Costa Rica is a Central American country, situated on a thin isthmus and bordered by Nicaragua to the north and Panama to the south. It is a country known for untamed rainforests, tropical wildlife and colourful Caribbean culture; images of idyllic beaches, lined with lush palms and colourful flora spring to mind just at the mention of its name. In fact, Costa Rica translates to ‘Rich Coast’, owing to the finery worn by the native population when the country was first discovered by Spanish explorers. Today, this meaning could easily be attributed to the vibrant coastline of the country, which runs along both the Pacific Ocean and the Caribbean Sea. It has been an increasingly popular destination for nature travel since the 1980s and today it is a world-pioneer of eco-tourism, as, despite its popularity, the abundant natural beauty of the environment has not been compromised, with businesses doing their best to choose sustainable options to accommodate visitors. Costa Rica has even been named the ‘greenest country in the world’. Combining lush rainforests, idyllic beaches and a cheerful atmosphere, a holiday to Costa Rica is a nature-lovers paradise. Most tours of Costa Rica begin in the vibrant capital of San Jose, with a historic downtown district awash with colonial architecture, before moving on to the fantastic natural wonders of the country such as the Arenal Volcano, abundant Manuel Antonio National Park, the cloud forests of Monteverde, for zip-lining adventures, and the precious beaches and jungles of Tortuguero. 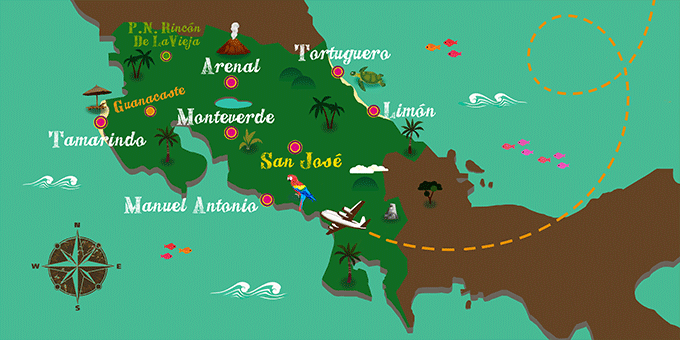 In 1502 the Italian explorer Christopher Columbus landed in Costa Rica. From this time onwards, Spanish settlers began to arrive in the country, joining the native population, made up of four tribes: the Carib, Boruca, Chibcha and Diquis Indians. Like much of the region, Costa Rica remained under Spanish rule until 1812, when independence was declared, a date which is still celebrated annually on the 15th September. The country has a strong tradition of coffee production, a crop which was first planted in the early 1800s, and due to its increasing worldwide popularity, became an important export commodity for Costa Rica. Immigrants from Caribbean nations arrived in the country to build a railroad to more easily transport the precious beans from the farms to the port of Limon, and these workers, many of which stayed for generations, have had a big influence on the country’s culture. Bananas were another important export during this era. With the early 20th century marked by a military dictatorship under General Tinoco and a civil war, which led to the complete abolition of the military in the 40s, there has been an uninterrupted democracy ever since. Costa Rica has successfully avoided the political upheaval of many other Central and South American countries and is known to be a peaceful and politically stable nation. An amazing 25% of Costa Rica’s territory is protected rainforest and jungle, home to a plethora of wildlife, including numerous species of playful monkeys and the elusive quetzal species of bird. The country is such a fantastic haven for wildlife that it is estimated to be home to 5% of the world's biodiversity. Considering its small size and in comparison to other countries, this is an amazing source of pride for Costa Ricans and a large part of the country’s appeal as a holiday destination. The county’s fabulous beaches of white sand and clear waters, which run along both coastlines, are also worth mentioning, as is the popularity of Costa Rica as a surfing destination. Hiking is another of the common activities, with great trails and facilities for trekking in the natural environment, particularly in La Fortuna, an area known for its waterfalls and hot springs. The highest point in the country is Cerro Chirripo, meaning ‘Land of Eternal Waters’ due to the many lakes and streams that can be found around the mountain. Its peak stands at 3819 metres above sea level. Lake Arenal is Costa Rica’s largest lake, overshadowed by the imposing Arenal Volcano and located close to the national park of the same name. There are 14 volcanoes in total to be found in the country, 6 of which have been active in the last century. The tallest is the amazing Irazu Volcano, famed for its other-worldly sulphurous green lagoon, its name meaning ‘mountain of tremors and fire’. With a year-round tropical climate, divided into a wet and a dry season, Costa Rica is truly a destination of rich natural beauty. Having completely eradicated deforestation in the country, visitors on a holiday to Costa Rica can enjoy a number of protected national parks, each which their own unique nature and attractions. Corcovado National Park is renowned for its biodiversity, considered to be one of the most biodiverse regions in the world. It has a variety of hiking trails, both along the coast and inland, taking visitors from tropical beaches into swampland, rainforests and mangroves. Its wildlife includes scarlet macaws, tapirs, jaguars and an amazing 4 species of monkeys. The national park of Tortuguero is famed for its nesting turtles, most notably the endangered green turtle species, who nest on the beaches at specific times throughout the year. This spectacle is a popular attraction for tourists who have the opportunity to watch quietly from a distance. Monteverde National Park is another of the popular nature reserves in Costa Rica, with a rich biodiversity of around 400 bird species and 100 mammals. Due to its situation, Costa Rica is thought of as the meeting point between Mesoamerican and South American cultures, and as such, has a diverse and colourful culture. Without a doubt, there is a big Spanish influence, seen in the language, religion and traditions of the country, whilst the laid-back atmosphere, music and cuisine, has roots in the Carribean cultures who also settled here. The charming element that many visitors love about Costa Rica is its happy-go-lucky ethos. ‘Pura Vida’, translated as ‘Pure Life’ is famously the local philosophy and is understood to mean a simple, stress-free life, something you can witness first hand if you have the chance to explore the local communities on a tour of Costa Rica. People also use the term ‘Pura Vida’, as a greeting, and as a question, to inquire about the well-being of their family and friends. With this focus on simplicity, it is no wonder that the country was named the Happiest Country in the World by National Geographic in 2017. Immerse yourself in the natural paradise of this country and find your ‘Pure Vida’! A package holiday to Costa Rica is the perfect way to experience the vast array of national parks, abundant nature and paradise coastline that make this one of the happiest places on earth.